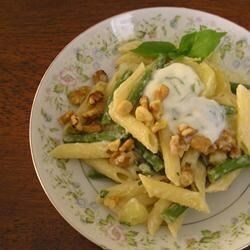 "Penne pasta is tossed with fresh green beans and red potatoes in a creamy pesto-yogurt sauce. Different and yummy!" Bring a large pot of lightly salted water to a boil, and cook the penne pasta for 8 to 10 minutes, until al dente. Remove from heat, drain, and return to the pot. Bring a medium saucepan of water to a boil, and cook the potatoes about 7 minutes. Place the green beans in the saucepan with the potatoes. Continue cooking about 3 minutes. Drain the partially cooked potatoes and green beans, and set aside. Heat the olive oil in a large skillet over medium heat, and saute the garlic about 1 minute. Stir in the potatoes and green beans. Season with salt and pepper. Cook and stir until potatoes and beans are tender and lightly browned. Toss the potato mixture into the pot with the drained pasta. Mix in the yogurt, pesto, and Parmesan cheese. Reserve a little Parmesan to sprinkle on top when serving. It's more tangy than expected, probably the yogurt. I made this for a couple of friends and got mixed reviews. It wasn't a "yummy" dish... it was more an "ok" dish. I made this with angel hair, and replaced the yogurt with light sour cream. Also added in mushrooms. Girlfriend is a PESTO FREAK and LOVED IT! This was just delicious!!! After seeing another reviewers suggestion, I added about a tsp of sugar when mixing the final ingredients together. Perfect! Was just ok. Good but we didn't feel it was anything special.